We are pleased to share with you our latest Insights report. 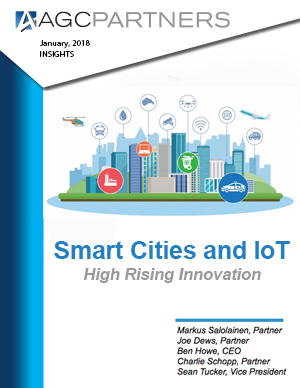 The market for Smart City innovations is gearing up for explosive growth, especially in Europe, as urban migration puts a strain on outdated city infrastructure and public initiatives such as climate change take hold. Spending on smart technology has increased considerably, from 0.7% of city IT budgets in 2005 to 4.1% in 2015, and is expected to reach 7.5% by 2025. As a result, the Smart City market is forecast to grow from $40.1B in 2017 to $97.9B in 2026. Fueling this surge in spending is the prospect for a triple bottom line for urban planners and budgets including significant cost savings, new technology employers, and cleaner and more desirable living conditions for the public at large. This report takes a closer look into the market as well as companies in the ecosystem, M&A and private placement activity.